ResumUP, an innovative recruiting company, now offers a major breakthrough for online recruiting with a two-sided innovation: visual resumes and visual vacancies. Recruiting is made simple and effective by combining visualization and matching tools: from this straightforward idea, ResumUP has radically enhanced the user experience in online recruiting. 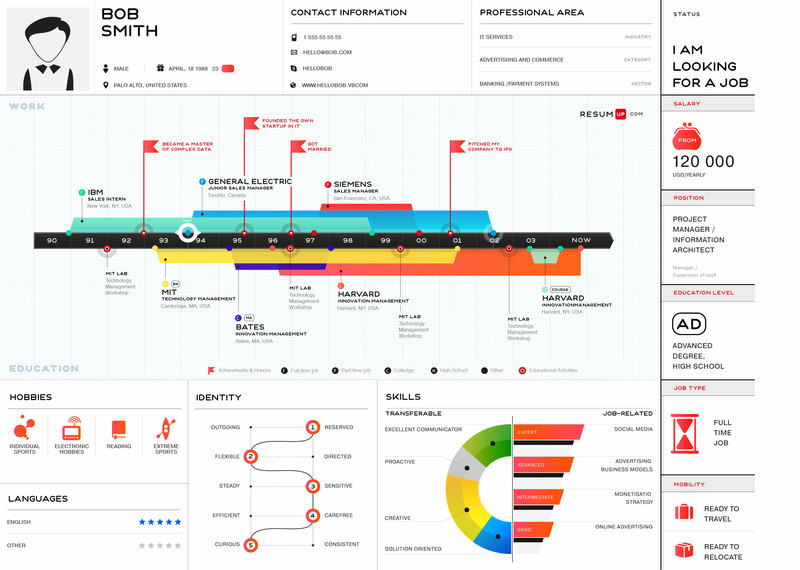 For job seekers, creating visual resumes has never been so simple. ResumUP uses data from social media profiles to make instant online resumes with an impressive infographic display that gives a visual punch to the applicant’s profile. With a little more editing, the job seeker's experience, personality and intentions are easily added to the display. It’s just as easy for recruiters to create visual vacancies that are far more attractive – and easier to understand – than traditional text-based job offers. And in a mouse-click, through multiple filters, recruiters can pick perfect candidates for open positions and screen them quickly and efficiently. No more time wasted on paper stacks or megabytes of resumes. The system automatically selects suitable profiles for each position. It allows users to see whether they fit the necessary criteria and to apply in the same visual way. As ResumUP founder Eugene Barulin puts it, "In recruiting, we’re still in 1950s. Sure, we use online job boards, text editing software and e-mail instead of newspapers, typewriters and envelopes. But the core document – the resume – remains the same. By matching visual resumes with visual vacancies, we aim to set new standards in online and social recruiting." Although ResumUP has launched only its beta version to date, pioneer companies have seen the opportunity and are trying the approach out. Among the major firms taking part so far are Facebook, Adidas, Yandex and Ostrovok.ru. Try the new experience of the ResumUP innovation in online recruiting. ResumUP offers cutting edge online recruiting solutions, filling a gap between visualization technologies, network recruitment approaches, professional social networks and job search sites. While using the latest in programming and visualization technologies, ResumUP's solutions are characterized by a radically simplified user experience. ResumUP has already generated over 1 mln. job seeker profiles around the world and cooperates with HR departments in a number of companies. ResumUP has already received awards at several major competitions, including the Webready contest, the TechCrunch conference and the Pruffi Startup Team contest (December 2011 - January 2012).